Poor David Stern. Poor Marshall Watson. Poor Florida Default Law Group. Poor Shapiro & Fishman. Three prominent members of Congress—including Barney Frank, the Chairman of the committee that oversees the banking industry—have written a letter to Fannie Mae demanding that they stop using foreclosure mills [PDF] that are under investigation for fraud. We are disturbed by the increasing reports of predatory foreclosure mills in Florida working for Fannie Mae servicers. 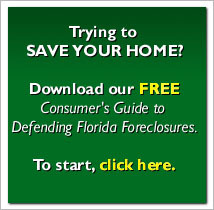 Foreclosure mills are law firms representing lenders that specialize in speeding up the process, often without regard to process, substance, or legal propriety… The firms have been accused of fabricating or backdating documents, as well as lying to conceal the true owner of a note. …In other words, Fannie Mae seems to specifically delegate its foreclosure avoidance obligations out to lawyers who specialize in kicking people out of their homes. …At the very least, we would encourage you to remove foreclosure mills under investigation for document fraud from Fannie Mae’s Retained Attorney Network. We also believe that Fannie Mae should… proceed on a foreclosure only when its legal entitlement to foreclose is clearly documented. …Why is Fannie Mae using lawyers that are accused of regularly engaging in fraud to kick people out of their homes? …what steps is Fannie Mae taking to avoid the use of foreclosure mills? …We look forward to your responses. I’m glad to see that Congress is finally taking a good hard look at the foreclosure fraud crisis that has ravaged Florida and the nation. I’m also glad they’re starting to apply pressure to the biggest player in the industry—government itself. (As the letter notes, Fannie Mae is now essentially a government agency.) Maybe if the government starts to clean its own house, and divert that firehose of money away from the banks and toward the borrowers, we can finally see the day when this mess is cleaned up.